Really rare birds that were hatched from eggs at London Zoo are being released into the wild. The four young ibis, nicknamed Iris, Indigo, Igor and Ivan by their London Zoo keepers, have travelled to Spain to make friends and bond with birds from other zoos from across Europe, before being released. There are not many of the Northern Ibis left in the world, just 600 of the rare birds live wild, all in an area of Morocco in Africa. They used to live in Europe but disappeared nearly 300 years ago, the decline in their numbers has been blamed on pesticides, habitat loss and hunting for their chicks and eggs. 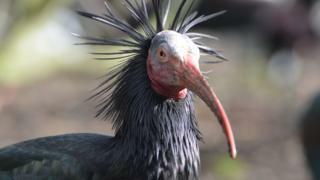 The birds are so rare, that they are ranked number 8 on London Zoo's EDGE of Existence list for birds. They're easy to spot because they're pretty funny looking with a bright red face, neck and sticky-up feathers. As well as making friends with the other birds in Spain, the four birds from London Zoo will be encouraged to look after themselves under observation from conservation experts. They will then be released in Andalucía, a part of Spain that has lots of grass, wildlife and water, an ideal habitat for the unique birds. ZSL London Zoo bird keeper Paul Atkin said: "I've been working with the breeding population of these remarkable birds at ZSL London Zoo for nearly twenty years, so it's a real joy to be working alongside zoos across Europe as part of their reintroduction in Spain. "We're really hopeful that they'll go on to breed in the wild - ultimately securing the future of the species."